This month's special cereal exhibit is called Cap'n Crunch & Friends. To see all of the cereals in this exhibit, click here. For April, our Cereal Maker of the Month is... Quaker. Click here to see every cereal they ever made. Upload a picture. Give your cereal a name. Print it out. Cut along the edges. Impress your friends! Click here to make your own custom cereal box. Click here to see the Top 100 Cereals. A classic card matching game with cereal boxes instead of cards! It's hangman... but all the words you have to guess are names of cereals. Test your breakfast cereal knowledge with quizes for both beginners and experts. Best cereal. I hope its not discontinued. I miss it. I've been looking for it since I was 6 years old. I wish Post would make it in a retro box... don't change the flavor. Guaranteed every 80s baby would buy a ton. Interesting you don't see banana flavored cereal though my only complain is that you can't taste the berry little to none. I loved Krumbles so much and have missed it all these decades. Decade after decade, and still wishing to be able to eat it again. Kellogg's is a huge company... I don't understand why they can't handle a little job like that; bring us Krumbles again! PLEASE! I have had the nickname 'Jet' for 60+ years because I loved this cereal. I was somewhat precocious and could recite my name, address and phone# at age 2 (born 1954 - did it in 1956). I was on my 2nd bowl and my mom told me if I didn't quit eating them, I'd turn into one. Trotted out to perform about 1 hour later. Asked my name, I said 'Jet'. 60 years later, I'm still 'Jet'. For those that loved them, Cap'n Crunch Peanut Butter is as close as you can get. I'm half-way thru my 2nd bowl as I type. Try 'em, really good. The Cereal Project is an ongoing effort to document every breakfast cereal ever produced in the U.S. which has received a near-nationwide distribution. From Granula (not Granola), the first ready-to-eat breakfast cereal ever produced in 1863, to the cereals being introduced to grocery stores as we speak, the Cereal Project aims to present pictures and descriptions of EVERY breakfast cereal including old favorites and failures that have long since been discontinued. So far, we have tracked down over 1,375 different cereals. 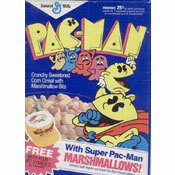 Take a walk down memory lane... or more specifically... a walk down memory cereal aisle. You can find cereals listed alphabetically, by manufacturer or by year of introduction. If you find a cereal that you loved, be sure to give it a vote and see how it ranks in our list of the most popular breakfast cereals of all-time. As you explore the many cereals, you'll find classic magazine advertisements and television commercials, along with a large library of vintage and current cereal boxes. Since their earliest introduction, breakfast cereals have transformed the way the world eats. Through evolving marketing techniques - most notably the evolution of the cereal box, cereals have changed the way we shop and have influenced the way all products are advertised. A trip through the history of breakfast cereal is a trip through the history of America. If you're going through The Cereal Project and you notice a cereal that's not represented, please let us know by posting a comment. 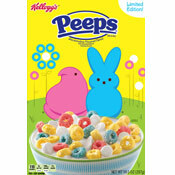 If you have a cool picture of a cereal that is in The Project, you can upload it on that cereal's page. You're pictures and comments are the best part of The Cereal Project.